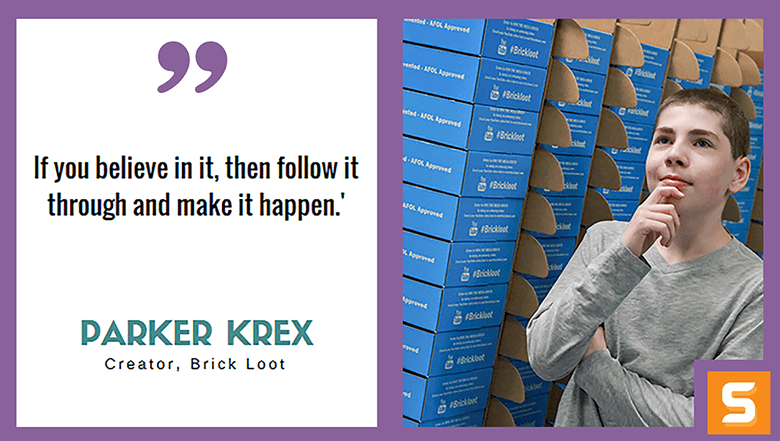 Parker Krex is a 12 year old CEO and creator of Brick Loot, a box subscription company for LEGO and Brick fanatics. Parker has a deep love for LEGO and has accumulated a massive collection. He has been playing with LEGO since the age of 3 and by the age of 4, he started reviewing his sets on YouTube. Then, his true passion for sharing LEGO with the world began. Parker is always looking for ways to make money so he can fund his LEGO addiction. One of the ways is his yearly garage sale. As Parker and his mom were sitting at their yearly garage sale selling all his non-LEGO toys, Brick Loot's concept was created. Parker and his mother put together a "Shark Tank Type" pitch to get daddy as an investor. It worked! In this interview with Startup Savant, Parker shares his entrepreneurial experience with his mom as his biggest cheerleader. He also shares how the idea for Brick Loot came about and how he got his business off the ground. Keep working on your idea and tweaking it until you find the perfect formula. When you are ready to start sharing, it gets as many opinions as possible and test, test, test. If you want to discover creative kits, toys for gifts or get updated as a LEGO fan, follow Brick Loot on Twitter! What ignited the spark in you to start a business? Where did the idea for Brick Loot come from? I shared my idea with my mom who then helped me write a business plan. We then put together a “SHARK TANK” type presentation for my dad to invest. I see Brick Loot growing as well as our partnerships with great brick related companies. We started shipping to the USA only and then quickly added the UK and Canada. By the end of 2016, we will ship to 7 countries. I think in 5 years, we may have different variations of the box for customers to choose from like girl box, boy box, advance builder box, etc. I really like to make sure the customers are happy and they feel the value of the box is high. It is tough to make everyone happy all the time with items, themes and products. We value our customers opinions and encourage them to provide ideas to always improve our products. What attitude/habits helped make you successful while starting Brick Loot? I am a little known for my OCD and like everything to be perfect and in its place. I think this is a great quality to have in business. I also LOVE LEGO so knowing your product inside and out is also KEY! Our target market is really wide. LEGO is fun for ages 6 – 99, so our customers come in at all ages, professions and hobbies. Our ideal customer is someone who likes custom kits, which he can not find at his local toy store and loves to be creative and play! My mom and I wrote a business plan, but we went back and looked at it on our 1 year anniversary and it was SO off! I think it helps you plan your concept, but once you start your business all kinds of things happen to take you off the path. As long as your mission is clear and you keep on track with that, then you should do fine. Who has been your greatest influencer along your entrepreneurial journey? How did they shape Brick Loot? I think my biggest influence has been my parents. They are both entrepreneurs and since I was a baby, they owned their own companies. I have seen how hard they work and what goes into starting something from scratch. They have backed me 100% in Brick Loot and are both full time with the company. I also love reading how Steve Jobs started and all the obstacles he went through to make his company succeed. Have you faced any failures with Brick Loot? How did you overcome it? I do not think we have had a MAJOR failure. I can remember once a product we all thought would be a huge hit did not go over so well with some customers and that was disappointing, but we learned from that experience. Work hard and dream big! If you believe in it, then follow it through and make it happen.